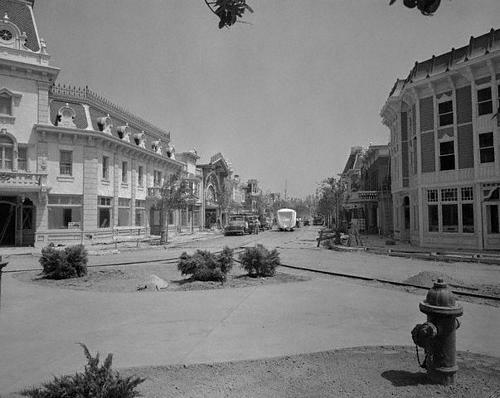 Disneyland’s Main Street USA 1955 Almost Ready! More than 180 acres of South Anaheim Orange Groves begin their transformation into the “Happiest Place on Earth.” To finance Disneyland, Walt Disney sells a vacation home and borrows against his life insurance. Excavation of the Disneyland site begins. “The Disneyland Story” airs (first episode of Disneyland television show). Despite plans to open the park without it, Walt decides to go ahead and build Tomorrowland, saying that the park can only open as a complete experience. Admiral Fowler advised that the outlook for Tomorrowland was very grave, and despite the warnings, Tomorrowland was completed in six months and opened with the Autopia, Space Station X-1, and the Monsanto Hall of Chemistry. Walt and Lillian’s 30th Anniversary celebrated at Disneyland. Disneyland opens with 18 attractions, including the Jungle Cruise, Tomorrowland, Autopia, Mr. Toad’s Wild Ride, and the Mark Twain. The televised opening is hosted by Ronald Reagan, Art Linkletter, and Bob Cummings. The 11,000 invitation only tickets to opening day are so easily duplicated that first day attendance shoots to 28,154, with an ABC television audience of 90 million. One entrepreneur folds a ladder over the park’s backside fence and lets people in for $5. Disneyland Hotel opens on 60 acre site next to the Park. Ticket books available for the first time, containing A, B, and C Tickets. On Thanksgiving, the Mickey Mouse Club Circus debuts with a parade down Main Street USA but is poorly received and discontinued in early 1956. Sleeping Beauty Castle’s interior walkways, Frontierland Shooting Gallery and Fantasyland Autopia, where riders race at a top speed of 11 mph, are among eight new attractions. Fantasy in the Sky Fireworks debut, 25 pack mules bought for $50 a piece. Alice in Wonderland, Grand Canyon Diorama, Main Street Fire trucks, and the three masted Sailing Ship Columbia debut. January 18: The Disneyland Kennel opens. E Tickets added to Ticket Books. America the Beautiful, Nature’s Wonderland (based on Disney’s True-Life Adventure movies), Art of Animation debut. January 21: The Disneyland special “A Gala Day at Disneyland” was released. It showcased the opening of the Submarines, Monorail, and Matterhorn. 25 Millionth Guest Admitted (Dr. Glenn C. Franklin) June, Tinker Bells First Flight. Former President Eisenhower and his wife visit Disneyland. Six tons of steel and 110 cubic yards of concrete become the Swiss Family Treehouse. Also opening are the Safari Game Shoot, the Pavilion Restaurant, and the Tahitian Terrace. “Audio animatronic” elephants arrive in the Jungle Cruise. Great Moments with Mr. Lincoln comes to Disneyland. The audio-animatronic Lincoln production highlights the park’s 10th anniversary. At 9:35 AM December 15, Walt Disney, 65, dies of cancer. Disney had been recovering from surgery a month earlier to remove one of his lungs. His brother, Roy, takes charge of the Disney entertainment empire. Pirates of the Caribbean premieres. Tomorrowland opens six new attractions, including Carousel of Progress, Flight to the Moon, and a redesigned Rocket Jets. First daily operating PeopleMover system in the United States begins operation. Mark III monorails debuted. January 21: “Pirates of the Caribbean to the World of Tomorrow” aired. This special took viewers on their first ride through Pirates of the Caribbean and gave a tour of the newly reopened Tomorrowland. It featured lots of behind the scenes footage of the construction of both. Hippies protesting the Vietnam War invade the park August 6. Some parade down Main Street USA and speak of “liberating” Minnie Mouse. Others take over Fort Wilderness on Tom Sawyer’s Island, yank down the 15 star American flag and raise a Viet Cong flag in its place. The protest escalates when the park is ordered closed at 7 PM and 30,000 guests are escorted out. Trash cans are set on fire and rocks and debris are thrown at police blocking the main gate. Police make 23 arrests. At 11:45 PM December 20, Roy Disney, 78, dies from a cerebral hemorrhage. Main Street Electrical Parade, which uses 500,000 twinkling lights, winds its way through the park for the first time. Bear Country becomes park’s seventh theme “land.” Attractions include Davy Crockett’s Explorer Canoes, Indian Trading Post, and Country Bear Jamboree. Walt Disney Story opens on Main Street USA. The exhibit includes memorabilia and pictures from the family’s archives and a short film on the park founder’s life. America Sings, a review of the nation’s musical history, premieres in Tomorrowland’s rotating Carousel Theater. Mission to Mars, an updated version of Flight to the Moon, opens. America on Parade, honoring the nation’s bicentennial, premieres. Gorrilla’s in Camp added to the Jungle Cruise Attraction. Space Mountain opens after two years of construction. The $20 million attraction costs more than Disney spent to build the entire park in 1955. Abominable Snowman added to the Matterhorn, November. Mickey Mouse turns 50 with a November celebration attended by 91,762 guests. The two acre Big Thunder Mountain Railroad opens in Frontierland. The E ticket remains in the language but disappears from Disneyland. The passport, good for admission and unlimited use of park’s attractions, is introduced at a cost of $12 for adults. July-Disneyland Band performs for the 50,000th time. Revamped Fantasyland opens, adding Pinocchio’s Daring Journey. The 17-minute 3D film “Captain EO,” featuring Michael Jackson, premieres in Tomorrowland. Big Thunder Ranch, a recreation of an 1880s horse ranch, opens in Frontierland. Star Tours is launched. George Lucas combines his “Star Wars” characters and space flight simulator technology to bring the attraction to life. Herbert Ryman brought out of retirement to draw conceptual sketches and themes for Indana Jones Adventure. Premier of Disney Dollars, First Disneyland State Fair. Fantasmic, Disney’s $30 million fire, water and laser show, debuts in the Rivers of America. Disneyland’s $100 million Toontown opens, the first new land since Bear Country in 1972. The cartoon village features Roger Rabbit’s Toontown Spin, the Jolly Trolly, Donald Duck’s boat and Chip ‘n’ Dale’s treehouse. When Monorail is up running again, pilots ad lib spiel about latest greatest Adventureland attraction opening spring 1995. Disneyland records its 350 Millionth Guest. The $100 million Indiana Jones Adventure debuts. Guests board World War II transports for a ride past bubbling lava pits, mummies, snakes and a giant rolling boulder. Disneyland introduces Fast Pass, a way to bypass long lines by getting a pass with a set return time. One Day Adult Ticket Prices increase from $39 to $41. Animator Marc Davis with Disney since 1935 dies on 1/12. Marc played an active roll in the planning of Disneyland. He developed story and character concepts for many Disneyland attractions, including Pirates of the Caribbean, the Haunted Mansion, and It’s A Small World. The Disneyland Kennel closes. March 16 – 450 Millionth Guest Admitted. (Mark Ramirez of Lytle, Texas). Mark Ramirez, a civilian production management specialist for the U.S. Air Force, was declared the 450 millionth visitor by Mickey Mouse just as he passed through the turnstile. Ramirez was honored during a ceremony where he was presented with a lifetime pass to the Disneyland Resort (Disneyland and Disney’s California Adventure), a stay at the new Disney’s Grand Californian Hotel, and a gift pack. He was also given the honor of changing the official attendance sign at the Disneyland park Train Station from 400 million to 450 million. “I’ll be able to point to the sign and say I made that change. It’s great being a part of Disney history,” he said. The family later rode in a cavalcade with Mickey Mouse down Main Street, U.S.A., led by the Disneyland Band. In addition, the Ramirez family was treated to VIP tours of both Disneyland and the newest park Disney’s California Adventure. Disneyland announced that full-time city paramedics were being stationed at its Anaheim parks in case of emergencies. Disney officials said they would beef up emergency services by stationing city paramedics full time at the park, a plan that will cost them $1.4 million annually and speed response time. July 2005 Disneyland turns 50!